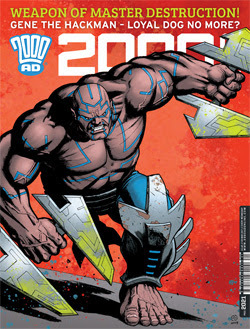 My thoughts on this weeks 2000 AD Prog! A cracking cover that rounds up Gene’s attitude in Kingdom! This mini story concludes in this issue, with Dredd using his street contacts to determine who is behind the flesh destroying chemical. The ending is interesting, as it gives Dredd a hard decision to make – one that he makes which I think would be very different to our own. this does well to re-establish that Dredd is a different person to what would like. in the end, the decision is taken out of his hands, although I wonder if it will have any knock on effects. The escape continues, and we discover more about the Dryad companion. It seems there will be some ramifications to this act though, which I expect will have some kind of explanation soon. Meanwhile we get to the thrust of the main story at the end in quite a theatrical way! Gene is given an impossible decision as he discovers the background to the secret the humans are hiding. Also he gets a grip on the plans by them all – I do wonder who to believe though, but in the end, I think Gene’s response is just right! The final attack continues as we are getting to the end of the war and this tale. The link ups between the story and the story teller are becoming more apparent, and I like the sacrifices made. Another nice one-shot story – these are doing well to re-establish Sinister Dexter and get them settled into their new/old city. I like the idea of their bar and the owner bot quite trusting them – but he seems to make the right decision!